The subdued atmosphere notwithstanding, BJD is quietly confident that Naveen will break records this time, bettering Sahu’s 2018 bypoll numbers. A strange quiet permeates the air in Bijepur. Maybe because it’s a Sunday; or it is because the summer is so gruelling in this part of Western Odisha that it has kept everyone indoors. But the absence of excitement - so commonplace with polls and to think of it, the frenzy associated with General Elections 2019 - is conspicuous. About 10 km away at Badabrahmani village, Sanat Gadtia, BJP candidate for Bijepur Assembly segment, is moving with a motley of supporters. From Bijepur to Saipali and then to Badabrahmani, he gets down at every village, meets the residents and talks to them as a campaign vehicle leads the party. Thrown into the ring very late in the poll process, he is doing everything he can. Of 260-odd villages under the three blocks that constitute Bijepur Assembly constituency, he has touched about 150 so far. “I have another 100 to cover and in next three days, I will make it to 50 more,” he says. There is nothing superficial about Gadtia. He shows no false bravado either, knowing that he is pitted against giant of a candidate - a man who has almost single-handedly demolished all political opposition in Odisha in the last 19 years and remained unconquered. Naveen Patnaik, BJD boss and Chief Minister, pops out of the posters and flex hoardings in every nook and cranny of Bijepur. Yet, that is the man the voters are missing. After he sprung a surprise by declaring his decision to contest from Bijepur - for the first time he would from two seats, Hinjli being the home - Naveen came to Padampur on March 25 to file his nomination papers. His public meetings at Bijepur and Gaisilat on Tuesday (April 16) would be his first and last appearance in this constituency before it goes to polls on April 18. Dilip Singh, who runs a small road-side eatery in Badabrahmani GP, wants to see his high profile candidate. “I don’t think I would get to see him campaign in this part,” he does not betray his disappointment. He has so many grievances - from irrigation to KALIA scheme - to present before the Chief Minister if he comes by. It is unlikely to happen and he knows it too. About another 10 km at Bairatikra, which is part of Barpali block, Manekar Bariha too has heard that Naveen is his candidate but is not hopeful of seeing him either. The incumbent MLA Rita Sahu came visiting two days ago but did not get down from the vehicle, he says in a mildly complaining voice. Much like Naveen is absent on the ground which he wants to make his second home in a political move to check the spread of BJP and Congress in Western Odisha, BJD’s campaign machinery for its star actor is missing too. 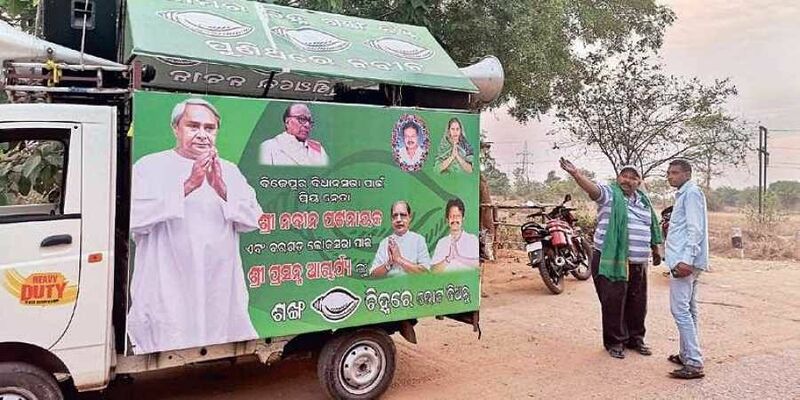 After travelling about 20 km in the rural pockets does one come across a lone vehicle with a BJD float mounted blaring the success about the party and its big boss. Cut to Barpali town. There is some buzz around in the small town but it is no match for what the ruling party is capable of. Last year, when Bijepur Assembly went to bypoll following the death of its MLA Subal Sahu (from Congress) and BJD managed to poach his widow Rita Sahu, the whole constituency was abuzz with a flurry of activities, announcements, leaders and officers. This time, it has gone quiet. “May be there is an order from the top that the usual festivities associated with electioneering should be dispensed with since the CM himself is the candidate,” says a party leader but without attempting to conceal the fact that the workers are dissatisfied with the low-key campaign. The subdued atmosphere notwithstanding, BJD is quietly confident that Naveen will break records this time, bettering Sahu’s 2018 bypoll numbers. “You may be right about the low-key campaign but wait for the results. Bijepur could not have got a better candidate to represent it,” says Pradyumna Tripathy, a key aide of Sahu. Much of the announcements that the CM had made before the Bijepur by-elections have been put to action and people are happy about it, he says. Key players of BJD like Sushant Singh, Anup Sai and Jitu Patnaik have been assigned the observers’ task for the constituency. But in the hinterland, villagers complain about lack of irrigation, drinking water supply. The grievances against KALIA assistance not reaching the beneficiaries continue. Many wonder what would happen when it comes to deciding between Hinjli and Bijepur for Naveen after the elections are over. With Narendra Modi wave making its sway across Bargarh Lok Sabha constituency, it’s not over till it’s actually over. The PM, by the way, would be in Sambalpur on Tuesday.